Dockmaster does major and minor repairs to docks, boat houses and lift systems. 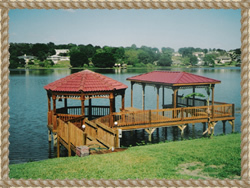 We also offer pressure washing and staining to protect and maintain the beauty of your dock. We suggest staining your dock with a UV protectent soon after construction to help prevent sun damage, This can cause warping, twisting, and splintering of new lumber.